Looking east at the Philadelphia skyline from University City. Nearly 20 years after Philadelphia accelerated real estate development with the incentives of a 10-year tax abatement, the future of the policy and historical effects have come under the microscope. Enacted in its current form in 2000, the tax abatement provides a 100 percent benefit for new construction and the value of any improvements or conversions to existing properties. 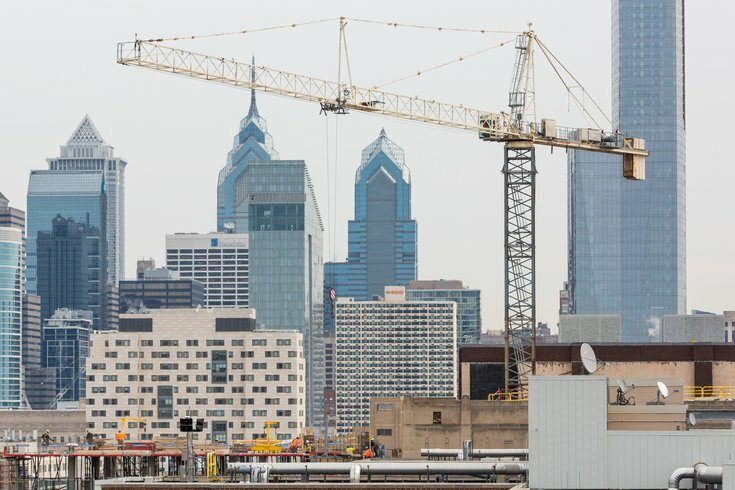 With rising property value assessments throughout Philadelphia over the past two decades, many neighborhoods have seen an increase in taxes influenced by new construction. But the new properties in these fast-developing neighborhoods are untouched by their own impact for a decade. What to do about the policy moving forward, particularly as city officials weigh an increase in local property and real estate transfer taxes, has become a matter of intense debate among stakeholders from developers, policymakers and trade groups to neighborhood associations, affordable housing advocates and other community organizations. Philadelphia City Controller Rebecca Rhynhart, who took over the city's independent auditing agency in January, released a detailed policy analysis on Friday examining various outcomes of the 10-yeart tax abatement since its inception. The report also offers six alternative scenarios to reform the tax, from eliminating it entirely to adjusting its target and amortizing it over a 10-year period. “The 10-Year Tax Abatement, a much-needed tax incentive at its inception, has spurred development in the city — development that may not have happened otherwise," Controller Rhynhart said in a statement. "On the other hand, long-time residents and homeowners feel frustrated by what they believe to be an unfair benefit going to wealthy developers, investors and individuals. With yet another property tax rate increase on the table, this frustration is only growing." About 26,800 properties have been granted an abatement in Philadelphia since 2000. About 60 percent have historically been new construction and 40 percent improvements or conversions. A cumulative total of $38.5 billion in assessed value has been abated, amounting to a cumulative total tax benefit of $1.05 billion to Philadelphia property owners and developers. In 2017, the number of properties with active abatements — 14,345, or about 53 percent of the 18-year total — received an annual tax benefit of $93 million. Over the life of their abatements, these 14,345 properties received a cumulative tax benefit of $442 million, which represents 42 percent of the city's cumulative $1.5 billion tax benefit since 2000. Top 20 Philadelphia neighborhoods with abated properties. The 12,477 properties with expired abatements received a cumulative tax benefit of $609 million. The latest annual property tax revenue associated with these properties was $83 million per their assessed values as of last month, assuming a 100 percent collection rate. That revenue – which is shared with 55 percent for the School District of Philadelphia and 45 percent for the city – might not have been generated in the absence of an abatement policy. 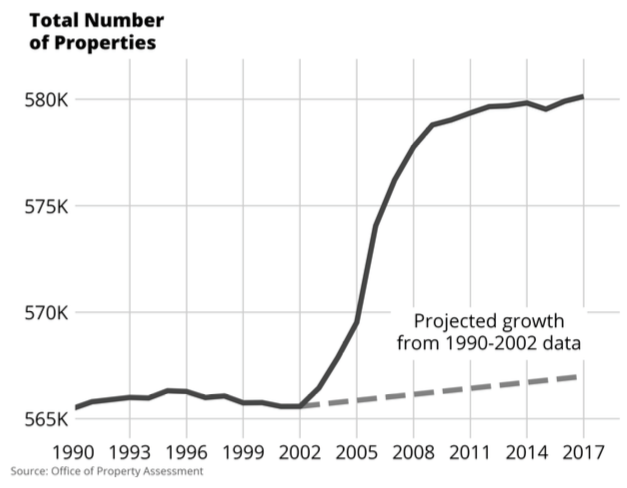 • Philadelphia has added 15,000 properties over the last 15 years, moving the city's total to 580,133 on the rolls of the Office of Property Assessment. Philadelphia regional share of real estate development has outpaced the surrounding suburbs. • The median home value per square foot in Philadelphia has tripled since 1996. For abated residential properties, the median home value per square foot is $202 — 93 percent higher than the citywide median home value per square foot of $105. • Just 2.5 percent of all properties in Philadelphia have an abatement as of 2017. The total sum of the abatements for these properties makes up 6.6 percent of all assessed value in Philadelphia. • Abated properties valued above $700,000 make up just 7 percent of actively abated properties, but receive more than half, 51 percent, of the tax benefit from all abatements. • The tax benefit associated with the abatement is concentrated in residential properties. However, the tax benefit associated with commercial properties is disproportionate: commercial properties account for 2 percent of total abated properties, but receive 11 percent of the total tax benefit. • Abatement tax benefits are concentrated in Center City and its surrounding neighborhoods. In total, 59 percent of the tax benefit for active abatements go to just 6 percent of Philadelphia neighborhoods. An analysis of development profitability in Philadelphia — including market values, rent prices and construction costs — found that most Philadelphia ZIP codes are not profitable for development even with an abatement. The top eight ZIP codes (19102, 19103, 19107, 19118, 19123, 19130, 19146 and 19147) were deemed likely profitable for development regardless of the abatement. The full policy analysis can be found here.